For better or for worse, I only rarely replay video games. When I start a game, I almost always make it all the way through the game; but once I’ve done so, my brain decides that it’s happy and that I should move on to something else. And constraints on my time are such that there’s always no end of candidates for that something else, either. Still, I’ve never felt entirely comfortable with my unrelenting march: I reread books not infrequently, and I don’t see any reason why I shouldn’t be doing the same thing with games. Part of my hope in co-founding the Vintage Game Club was that it would give me an excuse to revisit old favorites; it did so with Majora’s Mask , to mixed results. 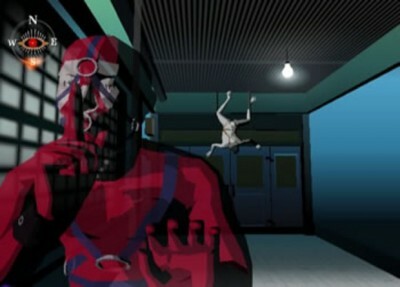 And more recently, we chose Killer 7 , which I’d been pleasantly bemused by on its original release. So: how would this return go? And then I started to play the game, with its quite idiosyncratic control style. But this time, it seemed like the most natural control style in the world. Between the time Killer 7 was originally published and now, I’ve seen a fair amount of discussion (most notably around Resident Evil 5 ) of the horror genre, in particular how, by taking on first person shooter characteristics, it has lost much of its power. Killer 7 isn’t solely a horror game, but it draws much of its power from that wellspring, and restrictions on movement and camera work very well with the game’s mood of uncertainty. Or at least I assume the game knows what it is doing; to be honest, I had no idea what is going on in terms of plot through much of the game. I’d tentatively been working under the hypothesis that the plot was more there for impressionistic purposes than because there’s a real narrative underpinning it, and I was just fine with that; Target 05, however, makes it clear that there’s a story lurking in the game if you want to dig it out, and Target 06 makes it clear that you should also look at the game in terms of recurring archetypes. (Which the repeated sound cues and the repeated level construction atoms—most notably the Vinculum gate, but also aspects such as the odd engravings—also reinforce.) I assume that I’ll replay this game again in another half-decade or so; I hope that, when I do so, I remember enough about writing this post that I’ll look up enough of the narrative details online in advance to be able to piece together more of the game’s backstory and its cross-sensory themes. Because, to be honest, I still don’t get the feeling that I understand this game at all. I am convinced that it’s a wonderful game, indeed that it’s one of the pinnacles of our art, but I don’t think I’m more than beginning to understand why that is or what it’s doing, to put my belief in words that any of my readers are likely to find convincing. Which, in its own way, is also cause for joy: if I can make progress down that path of understanding, I’ll have accomplished something.